Notice: All of the scrambled paragraphs on this blog are a free, non-commercial resource purely for educational purposes. They are 100% legal under the Fair Usage Law. (Basically I took properly cited source material and meaningfully changed it into a unique educational tool.) No commercial entity has the right to remove and display this content. By using this website you tacitly agree to the terms that this material cannot be reproduced for distribution via the internet or other means. Levassor and his partner Panhard operated one of the largest machine shops in Paris in 1887, when a Belgian engineer named Edouard Sarazin convinced Levassor to manufacture a new high-speed engine for the German automaker Daimler, for which Sarazin had obtained the French patent rights. _____ (Q) In 1889, visitors to the Paris exposition celebrating the 100th anniversary of the French Revolution were able to admire not only Gustave Eiffel's now-famous tower, but also a Daimler-produced automobile with one of the new Panhard et Levassor-constructed engines. 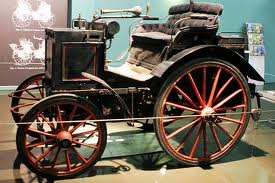 _____ (R) In the years to come, this arrangement, known as the Systeme Panhard, would become the model for all automobiles. _____ (S) When Sarazin died later that year, the rights passed to his widow, Louise. _____ (T) The year after the opening of the exposition, Levassor married Louise Sarazin. _____ (U) By 1891, Levassor had built a drastically different automobile, placing the engine vertically in front of the chassis rather than underneath or behind the driver--a radical departure from the carriage-influenced design of earlier vehicles--and put in a mechanical transmission that the driver engaged with a clutch, allowing him to travel at different speeds. The dawn that followed the dark and frigid night of December 15, 1944 was foggy, dreary, and foreboding to the troops of the VIII Corps in their positions along the front line between Echternach and just south of Konschau in Belgium, a distance of approximately 75 miles, facing the defensive structures the Germans called the Siegfried Line. _____ (Q) It had been a quiet sector since early October, and the American front was thinly held, with three infantry divisions on the line and an armored division in reserve. _____ (R) Indeed there was no strong or aggressive force facing them, at least in the supposedly trained judgment of unit, divisional, and corps intelligence. _____ (S) But it would have been "thinly held" if it had had twice those troops, consisting as it did of widely separated strong points connected generally by a few motorized patrols. _____ (T) However the risk must have been considered extremely slight, for commanders all the way down the line were urged to make their men comfortable for the hard winter ahead, and to take measures to reduce the serious problem of trench foot, a disabling disorder resulting from repeatedly wet feet in very cold wet weather. _____ (U) They were consequently taking what General Eisenhower described as a "calculated risk" when he had depleted VIII Corps' strength by numerous units to assist Field Marshal Montgomery's planned attack in the north. The Bohr Model is probably familiar as the "planetary model" of the atom and is used as a symbol for atomic energy (a bit of a misnomer, since the energy in "atomic energy" is actually the energy of the nucleus, rather than the entire atom). _____ (Q) This similarity between a planetary model and the Bohr Model of the atom ultimately arises because the attractive gravitational force in a solar system and the attractive Coulomb (electrical) force between the positively charged nucleus and the negatively charged electrons in an atom are mathematically of the same form. _____ (R) The form is the same, but the intrinsic strength of the Coulomb interaction is much larger than that of the gravitational interaction. _____ (S) Gravitation is always, however, attractive in our present Universe. _____ (T) In addition, there are positive and negative electrical charges so the Coulomb interaction can be either attractive or repulsive. _____ (U) In the Bohr Model the neutrons and protons occupy a dense central region called the nucleus, and the electrons orbit the nucleus much like planets orbiting the Sun (but the orbits are not confined to a plane as is approximately true in the Solar System). Amenhotep IV changed his name to Akhenaton, meaning "the Servant of Aten" early in his reign. _____ (Q) At first he attempted to place temples for Aten next to the temples for other gods. _____ (R) Eventually he closed all the other temples and took their revenues. _____ (S) But fairly early in his reign he introduced a monotheistic worship of Aten, the Sun God. _____ (T) Akhenaton started his reign as most Egyptian kings. _____ (U) Ultimately, Akhenaton placed himself as the intermediary between Aten and the people, helping eliminate the need for the priesthood.